Taken 8 May 2006 at 2:01 AM. Earlier in the evening SW3c passed almost over the top of M57. 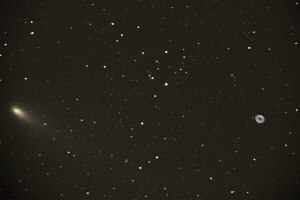 Comet SW3 broke into many fragments of which this was one. Comet Linear C/2000 WM1. Taken 21 November 2001. Comet Linear C/2000 WM1 was photographed on November 21, 2001. You may notice that the stars are trailed in the image, this is because the autoguider was tracking the comet and it is quickly moving relative to the background stars. 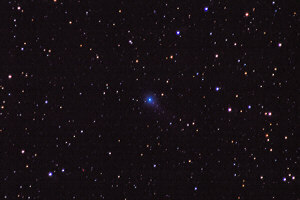 Comet Linear C/2001 A2. 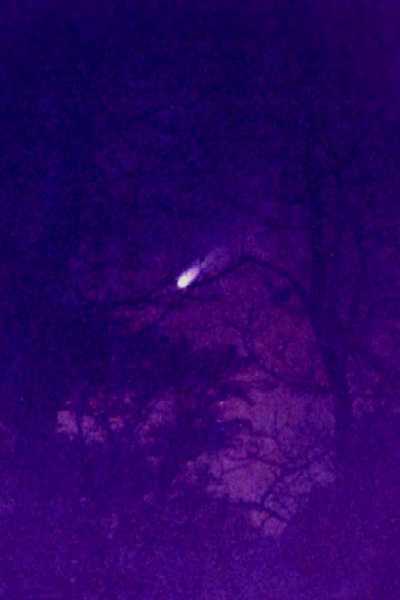 Taken 14 July 2001. 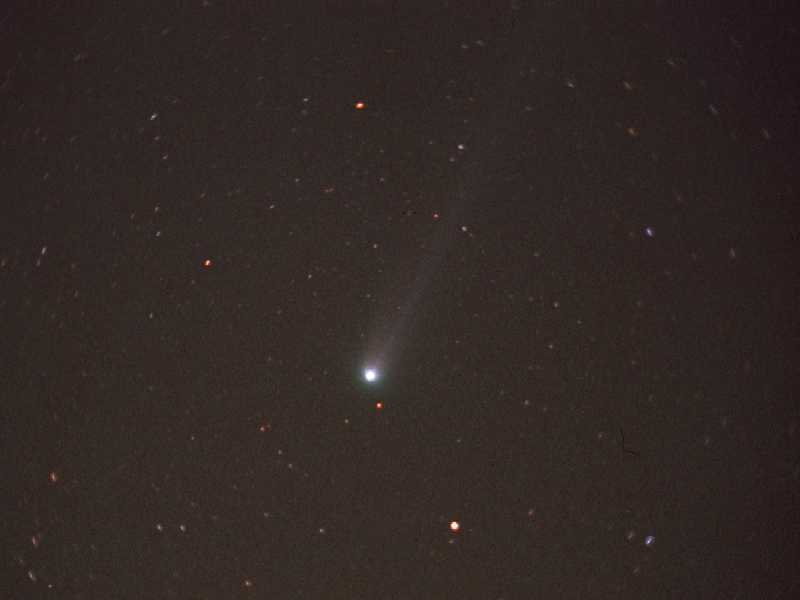 Comet Linear C/2001 A2 was photographed on July 14, 2001, It is now on its way away from the sun but It has been amazing astronomers because its brightness keeps surpassing predictions. 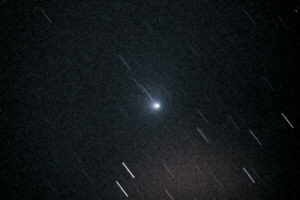 You may notice that the stars are slightly trailed in the image, this is because the autoguider was tracking the comet and it is quickly moving relative to the background stars. 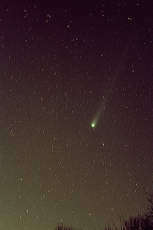 Comet C/1996 B2 Hyakutake. Taken 26 March 1996. This 5 minute exposure on Kodak Gold 100 was taken with a Minolta X-700 using a 50mm f1.7 lens and a 2x teleconverter. The negative was scanned onto a PhotoCD. This photo was hampered by significant sky glow from a half moon, the usual urban light pollution of southeastern Michigan, and an annoying motion activated flood light at the site. In spite of the 'fog' good color can be seen in the stars. Polaris is the brightest star in the image and is seen near the bottom center. 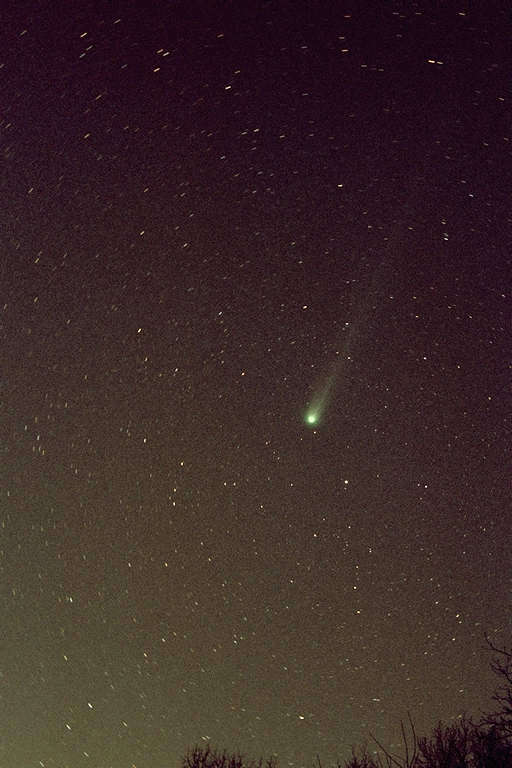 Comet C/1996 B2 Hyakutake. Taken 26 March 1996. This 4 minute exposure on Fuji NPH (400 asa) was taken by my mother with her Canon EOS 630 with a Canon 35-350 f/3.5-5.6L ultrasonic zoom at 300MM. Tripod mounted, cable release at f/4.5. The negative was scanned onto a PhotoCD. This photo was taken at the same site and time as the above image and was hampered by the same issues. Stars down to apparent magnitude 9.7m are recorded. 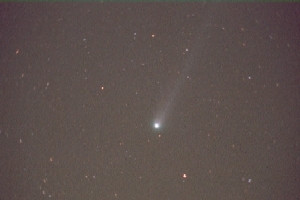 Comet C/1996 B2 Hyakutake. Taken 26 March 1996. This 4 minute exposure on Fuji NPH (400 asa) was taken by my mother with her Canon EOS 630 with a Canon 35-350 f/3.5-5.6L ultrasonic zoom at 40MM. Tripod mounted, cable release at f/3.5. The negative was scanned onto a PhotoCD. This photo was taken at the same site and time as the above image and was hampered by the same issues. Comet C/1995 O1 Hale-Bopp. Taken April 1, 1997. This 2 minute exposure on KODAK TRI-X Pan (5063 ISO 400 B&W) was taken with a Minolta X-700 using a 28-105 Vivitar Series 1 zoom at 105mm @ f3.8. 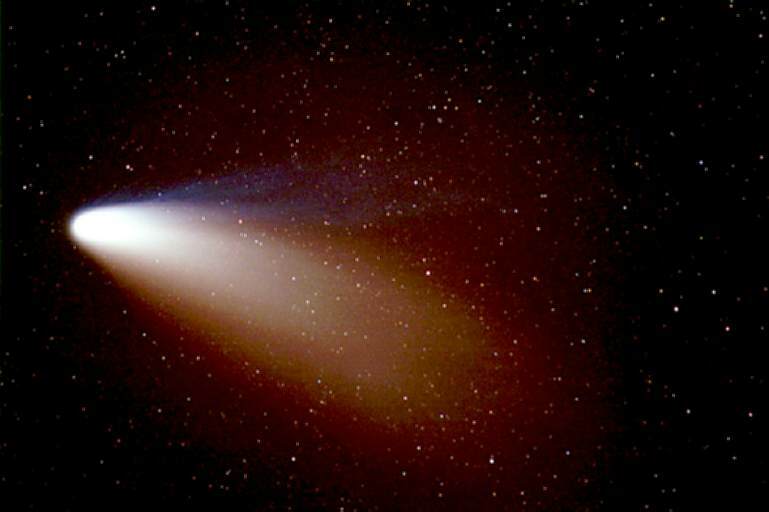 Comet C/1995 O1 Hale-Bopp. Date unknown. This 3 minute exposure on KODAK TRI-X Pan (5063 ISO 400 B&W) was taken with a Minolta X-700 using a 28-105 Vivitar Series 1 zoom at 28mm @ f2.8. Plenty of sky glow from Flint, Michigan is visible. Comet C/1995 O1 Hale-Bopp. Date unknown. A coworker of mine with a 35mm Nikon using a 300mm lens piggybacked on a 10" Meade LX3 took this unguided 10 minute exposure on Kodak Gold 400. The print was scanned using a HP flatbed scanner. 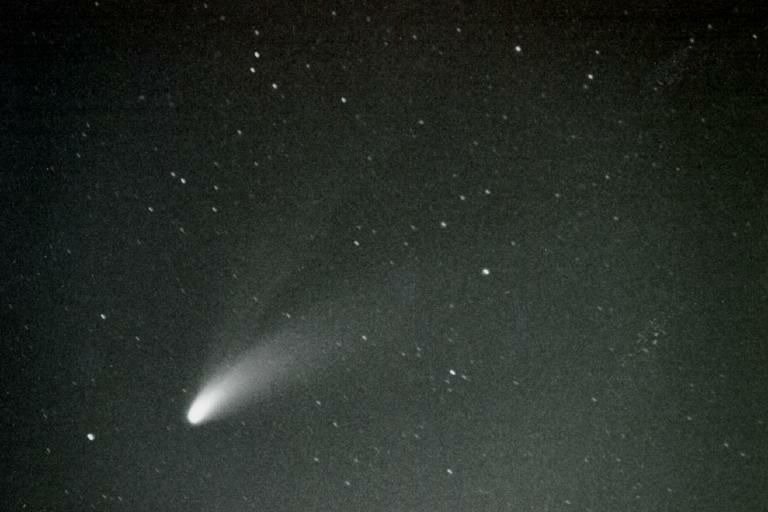 Comet C/1995 O1 Hale-Bopp. Date unknown. 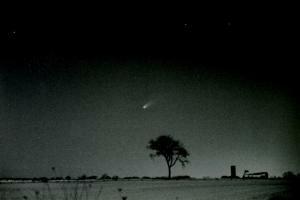 My dear friend Pavel Kodytek took this image of Hale-Bopp in the Czech Republic. I do not know any other details but he was kind enough to let me post it here.